That time Kayla Alexander tried to drop back to corral the ballhandler, and Pierson received the ball in enough space to go right by her for the layup (you can also see Appel-Marinelli watching her go by again, for what that’s worth). Obviously, none of the options are perfect or that’s the one everyone would use all the time. Different teams tend to favour certain options depending on philosophy (Indiana have been very aggressive defensively for years, which means they trap high with double-teams whenever it’s a viable option) or personnel (Phoenix like to switch almost everything, but damn it’s nice when Brittney Griner can just fade back towards the rim and scare everyone away). Initially, Brianna Kiesel goes a mile under the screen that’s set for Moriah Jefferson, staying in front of her and protecting against penetration, or the problems that could be created by running into the screen. They did this constantly, against both Jefferson and Sydney Colson. Why Jefferson never just pulled up in all that space to shoot the three, you’d have to ask her and Dan Hughes. That was supposed to be her main advantage over the injured Danielle Robinson at the point for San Antonio. Then when the ball is reversed to the other side of the floor, Dallas take a different approach – because Kayla McBride is the one Stars player who actually scared them. Both Wings defenders go to McBride, forcing the ball out of her hands, and trusting the remaining three Wings defenders to deal with whatever happens behind them (Hamby blows a contested finish, and no one is particularly surprised). Some of this is instinct, of course. If the screener leaves a little gap on one side, the defender might go under or over regardless of the scheme their coach drew up beforehand. But most of this is planned, and it shows how much thinking is involved. Ideally it’s drilled into all the players’ heads to enough of a degree that they do it without thinking, but that’s hard when you’re preparing for a new opponent every day or two. Tiffany Hayes turns her body to prevent Monique Currie from even being able to use the screen, forcing Currie down towards the baseline (often referred to as an ‘extra defender’) and the defensive help from the teammate who was initially guarding the screener. The purpose is to prevent the ballhandler from making it into the middle of the floor, which is typically the most dangerous place she can get. Then she either has a lane to the basket, or other defenders have to help, leaving open players either near the basket or in the corner. You won’t see too much of that rotation action, because it just creates too many moving parts for the defense. Eventually, someone’s likely to be open to drive or shoot. Most teams will trust that the screener won’t have much time or space to do anything dangerous before the defender can recover. And in basic terms, that’s about it. Obviously, there are a huge number of variations in how teams run these sets, and how they defend them, but that’s the basics. It’s still one of the easiest ways to bend a defense out of shape, and it’s still what most teams will default to when the shot clock’s trickling down and nothing else has worked. A ballhandler who can make the right decision (and execute the shot/pass once the decision is made), and a big who can set a solid screen (and hopefully catch a pass and finish a layup) provides a pretty good foundation to start building an offense. Now on to a new feature I’m calling The W Dozen. Partly because it sounds nice, and partly because 12 items seems about right to cover everything I might want to mention from the week’s events in the WNBA. They could be literally anything, including roster moves, individual plays, injury issues, teams or players that have been particularly noteworthy, an ugly uniform, or a commentator that deserves special attention. Some will be positive, some negative, hopefully most at least mildly interesting. If you haven’t heard, Indiana Fever head coach Stephanie White has been hired by Vanderbilt University to take over their women’s basketball program, so will be leaving the Fever at the end of the 2016 WNBA season. I find this disappointing for multiple reasons. Firstly, she’s a damn good coach, who only recently slid over to take on the top job in Indiana, and the WNBA can’t afford to lose coaches with her talent. Secondly, the basic fact that she sees Vanderbilt as a step up from the Fever disappoints me. Some took issue when I described her choice that way on Twitter, including her former boss in Indiana, Lin Dunn. I understand that some coaches may prefer the college environment, teaching kids, and undoubtedly earning more money. But White has clearly decided that she’d prefer it, so sees it as a step up for her. Which I don’t blame her for. But she’s been in the pro ranks for a long time, nearly a decade, and not felt the driving desire to jump back to NCAA basketball. Personally, as someone who cares a lot more about the pro game than the NCAA, it’s just a shame. None of which is meant as a criticism of White. She’ll probably do a great job, and good luck to her. So far it doesn’t look like her imminent departure is going to derail the Fever’s season. The news broke that she was a final contender for the job hours before Indiana’s game on Friday night, and her team came out focussed for a win over Atlanta. Maybe with Tamika Catchings playing out her final season as well, the team’s already in the mindset of knowing this is a big year with some rebuilding to come when it’s over, so they better fight for every win they can. White’s also been an impressive television colour commentator, so it’s unfortunate that she’ll presumably be too busy to continue that role. But hiring Carolyn Peck to assist her goes a long way towards balancing out those scales. Dunn also took a coaching job this week, coming out of retirement to become an assistant with Kentucky. 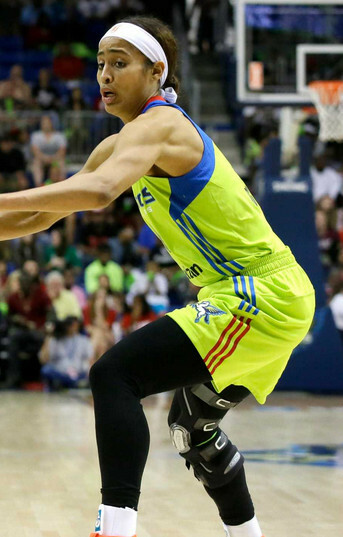 On a lighter note, the WNBA decided to do away with white uniforms this year, turning every game into a colourful affair. You get the impression that they didn’t entirely think it through. Some teams, like Minnesota, don’t really have an accent colour different enough from their core one to provide a secondary uniform. So the Lynx look like someone left a black sock in the wash with the old white unis. On the other hand New York’s ‘seafoam green’ (their term) and Dallas’s ‘seriously ill snot green’ (my term) are just generally hideous when used as a central colour rather than an accent. All this, of course, while Adidas go on providing uniforms that are annoyingly ‘uniform’ across the entire league, and hence disappointingly dull. Nike take over providing all the WNBA’s apparel from next season, so changes are on the way. Exactly what those will be, we’ll have to wait and see. We’ll get into all sorts of advanced stat details in this space over the course of the season, but for now we’ll keep it simple: The Los Angeles Sparks have played four games (including three in five days on an East coast road swing), and won them by a combined 80 points. For those who can’t do very, very simple arithmetic, that’s an average winning margin of 20 points per game. That’s ridiculous. With everyone onboard and healthy from the start of the season, a core who know each other and the system, plus veteran backups, the Sparks are flying to start the season. It’s just a shame that they don’t face Minnesota until late June. I don’t want to wait that long. The Stars look horrible in a variety of ways, and the fact that they’ve already committed ten shot-clock violations (in just three games) is merely one illustration. The highest total in the league last season was 40 (by Washington) while the Stars are currently on pace to break 100 (albeit extrapolating from an unfairly small sample size). Having watched them all, it’s hard to see one particular factor, beyond the team’s general difficulty in creating decent shots. It certainly wasn’t all Moriah Jefferson’s fault in her first few games as a pro, although the time wasted trying to hear what Dan Hughes wanted her to run certainly didn’t help. It’s too early to be making any entirely confident statements about how 2016 will play out in the WNBA – but it doesn’t feel like going out on much of a limb to suggest that it’s likely to be a very long season in San Antonio. Back to nicer topics. How sweet is this play by Minnesota, in a game they were leading by just five points heading into the final minute? Lindsay Whalen makes the initial pass to Sylvia Fowles at the elbow, then runs down to set a pin-down screen for Seimone Augustus on the opposite wing. Augustus comes up into an almost immediate dribble hand-off with Fowles, coming close enough to force Seattle to switch defensively. Augustus still has to make a tough pass in to Fowles, and Ramu Tokashiki has made the right play to come off Rebekkah Brunson in the far corner and help on Fowles inside. Fowles turns into the short jumper and scores over her regardless. Beautifully drawn up by Cheryl Reeve, and made all the better by Seattle actually doing a pretty good job defending it. Good defense is sometimes just beaten by better offense. I use this example from the Mercury broadcast last week solely because it’s the most recent one that I noticed, but this has happened repeatedly over many years, all around the league. Spell the names right. It’s such a simple thing, but it makes you look so amateurish when it’s screwed up. There are two ‘l’s in Jewell, and one in Crystal. 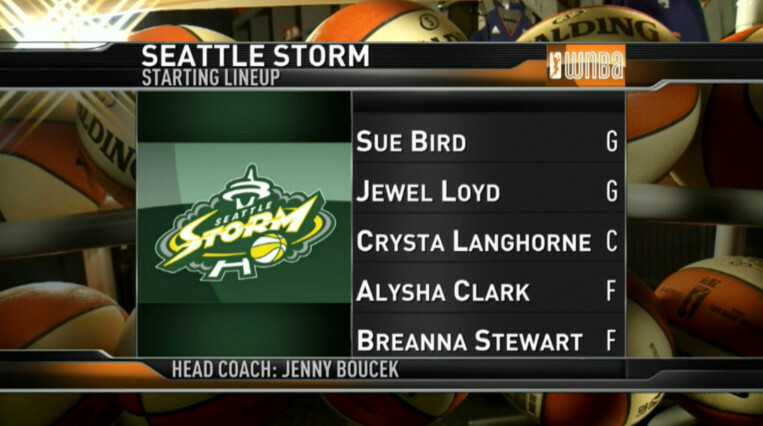 The names are written everywhere, including on the WNBA’s own website. The only one I’ll accept variations on is if Eugeniya Belyakova makes her way into LA’s lineup at some point this season. Given that it’s being translated from the original Cyrillic, I’ve seen her first name spelled at least three different ways. But that’s your only pass. I won’t always bother filling in the minor moves around the league, but for this week this makes the dozen. New York re-signed Swin Cash, after waiving her before the season began due to the Amanda Zahui B trade taking them narrowly over the salary cap (it was literally a few hundred bucks). It was a little embarrassing for Cash, especially as it took a while for what was going on to become public knowledge, but now she’s back with the Liberty (and immediately back playing in crunch-time, illustrating how few alternatives New York have to defend the league’s big wings). The lady that will now be known in this space as CYTH for the rest of 2016 is having herself some fun to start the season. With Lawson gone and Latta hurt, someone had to step up and score some points for the Mystics, and Hill appears to have decided that it might as well be her. She’s had a rocky road in the professional ranks so far. An awful rookie season was followed by one essentially lost to pregnancy, and then last season was something of a rollercoaster. Every game where it looked like things might’ve ‘clicked’ for her was followed by a couple of ugly ones, and the 35% shooting that it all added up to was pretty miserable. We’re only four games in, and some of her extra production is undoubtedly just because there are more minutes and shots available, but there are several positive signs. The floor percentage is at least nearing 40%, she’s hit a little better from outside, and oh my – the free throw rate. She shot 62 free throws the whole of last season, playing 32 games. This year, after just four appearances, she’s made 35 trips to the line. She’s unlikely to keep up that pace – if she did she’d break Angel McCoughtry’s WNBA record for attempts in a season – but it’s an illustration of how much more aggressive she’s being. And even if your shooting percentage is poor, if you top it up with a huge pile of free throws then it’s not quite as much of an issue. She becomes Contract Year Tayler Hill because like the vast majority of fourth-year WNBA players, she’ll be coming off her rookie-scale deal at the end of this season (becoming a restricted free agent), so she needs to perform this year to get paid. Another year similar to what we’ve seen before and she might’ve hung around on a middle-of-the-road Jasmine Thomas kind of contract. Or with a little bad luck she might’ve been out of the league entirely. If she keeps performing anything like this, someone around the league will give her max money. And when you only, finally, start playing like this as your contract is about to run out and your neck’s on the line, you get CY added to your name. Buyer beware that sometimes these CY players go right back to their old selves once they’ve earned that new deal. We’ve got a couple of players coming back from major knee injuries this season, and they’ve both looked shaky so far. In Connecticut, Chiney Ogwumike looks like she’s moving okay when she’s just running the floor or rotating around in halfcourt sets. But there’s little of the explosion that we used to see, and she’s making virtually no impact on the scoreboard whatsoever. They’re obviously trying to bring her along slowly and keep her minutes restricted, but it’s worrying to see such an outstanding athlete so limited. Hopefully there’s a lot more to come. Meanwhile in Dallas, Skylar Diggins finally made her first appearance of the season in their home opener, after travelling to their three Eastern road games and never making it onto the court. She looked desperately rusty. Wearing a fairly bulky brace on the knee, she appeared in very brief stints and her shot was off by a mile. Even a pair of free throws were lucky to hit the rim. Fortunately for her, the Wings are doing a solid job of holding the fort while she’s out, and they can bring her along slowly. As with Ogwumike, it might not be until next year that she’s back to full strength. In both cases, we just have to hope that they get there eventually. This is more a preview than an actual item. Those who have read my work over the years, particularly when I covered every game, will know that I love it when coaches start trying to play chess rather than being happy with checkers. Any lineup fiddling and cross-matching that takes players away from point guard defending point guard, shooting guard defending shooting guard etc. is particularly interesting. So for example, in Chicago, Pokey Chatman continues to try to work out where the hell she can put Elena Delle Donne on defense. Against Minnesota she briefly tried to cover Maya Moore, moved to Seimone Augustus, swung down to power forward and whoever the Lynx had playing there, then moved back to the perimeter in the second half and did the best she could. Last night while the Sky were being blown out by LA she started off guarding Essence Carson, while Nneka Ogwumike was on her at the other end. Some of these contortions are obviously created by Delle Donne’s own offensive threat. Opponents want a mobile defender on her, but one with some size so that she can’t just physically dominate them (although Minnesota tried Jia Perkins for a while, which didn’t work out too badly but was comical to watch). But Delle Donne can actually be an impactful defender when she’s around the rim. She’s long, and her impressive coordination makes her a useful shot-blocker, despite her deficiencies as an individual defender. When she’s drifting around trying to cover shooting guards, she’s not often in great position to make those plays. Fluidity and versatility is a useful element to have within your lineups, but too often it feels like Chatman’s machinations with Delle Donne are searching for an answer, rather than posing questions for the Sky’s opponents. Expect me to pick into these small coaching decisions all season long. It’s interesting because it shows how New York stifled Atlanta’s pick-and-roll out of their ‘horns’ set all game long. The first big (Kiah Stokes) ‘hedges’ hard on the ballhandler while her teammate (Tina Charles) switches onto the roller down the lane, allowing Stokes to recover out top while never leaving anyone too dangerous or too open. It’s smooth, and organised, and shows how Bill Laimbeer and his crew have been drilling his squad for the last couple of years. But then it shows how much of this stuff can end up being futile. Atlanta swing the ball across, New York ‘ice’ the side pick-and-roll like they’re supposed to… and Tiffany Hayes drives right by Rodgers and Stokes for the and-one finish at the hoop. You can diagram and drill everything for as long as you like; sometimes just playing basketball still wins. The W Dozen and an accompanying piece will be back next week. If you’re lucky there might be an extra article before then, but I’m not making any promises. As ever, you can comment below, or contact me via email or on Twitter. This entry was posted in wnba and tagged w dozen, wnba.